The Cider Farm revives a tradition that provides the perfect sip for winters in Wisconsin. In days gone by, apple brandy was a celebrated spirit here in the States, but like most things, tastes change and something more nouveau comes along to replace it. I’m extremely happy to see a revival in interest for it, and even more pleased to report that we have a top-tier organic product right here in southern Wisconsin. The Cider Farm, owned by Deirdre Birmingham and husband John Biondi, is an organic orchard with about 2,400 apple trees located in the beautiful rolling hills of southwestern Wisconsin, just outside of Hollandale. Their orchard comprises a curious mix of English/European cider apple varieties that are grown specifically for properties that make them ideal for high-quality cider. If an outside party had listened in on our interview, they may have mistaken the topic for grapes instead of apples, because the dialect of cider-makers runs very closely to that of vintners. Birmingham talks of the acids, tannins, and sugar content of these apples as she describes how they arrive at their particular cider. Suffice it to say, there will be no Galas or Braeburns found on The Cider Farm’s 166 acres. But what they do grow results in ideal cider for distilling to apple brandy. Deirdre and John met in 1995 while she was working on her dissertation in agriculture here at UW-Madison. She has worked in agriculture her entire adult life, but primarily in Africa to help improve rural livelihoods. Biondi’s expertise lay in business start-ups, and he’s had great success with companies such as Xolve and Lucigen, both located in Middleton, Wis. Interestingly enough, when the two met, Biondi already had a “start-up” file for farm-based ideas, while Deirdre had never even considered her own farm! “I hadn’t even taken one horticulture class,” says Birmingham. “I was interested in developing other country’s agriculture.” But people like Biondi have a unique ability to paint their vision in a way that allows others to see the beauty and get involved. Which is just what happened—and the rest is history. In 2002, they bought their farm and have been bootstrapping it ever since to make the dream a reality. 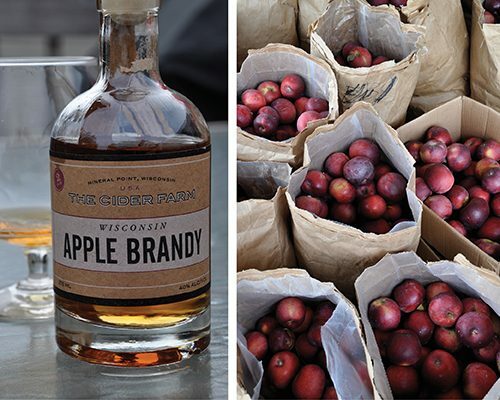 The Cider Farm just had their first apple brandy release party at Yahara Bay Distillery in October, and it was met with a great deal of enthusiasm. The Cider Farm doesn’t have a distiller’s license, which is why Yahara Bay became involved. Nick Quint, the owner of Yahara Bay, was approached by Birmingham a while back to see if their two businesses could join forces. Quint was quickly onboard with her idea. I applaud Quint, because Yahara Bay was already distilling their own apple brandy, yet he still decided to work with The Cider Farm to help them achieve their dream. Another wonderful example of small businesses working together outside the main frame of standard American business practices to allow the tide to raise all ships. Bravo. Now, understand that distillation is only the beginning. Based on a great deal of research, The Cider Farm chose to age its apple brandy for two years in charred oak bourbon barrels with some of their own wild apple wood added in for flavor. This longer aging process really allows the brandy to develop a wonderfully smooth and flavorful finish. Their goal was to produce a truly top-tier product that people will fall in love with. I’ve had it on three occasions now, and I’m sold. In a snifter, on a cold winter’s night, it’s just about perfect. If you’re interested in getting your own bottle, Yahara Bay is the only place you can buy it. And don’t wait: This year’s product is already 80 percent sold. However, if you miss this year’s, don’t despair. “If we sell out this year, we’ll just start taking reservations for next year’s product,” says Birmingham. My advice, just call now and hedge your bets. Worst-case scenario, you’ll have an extra bottle next year just in time for the holidays.